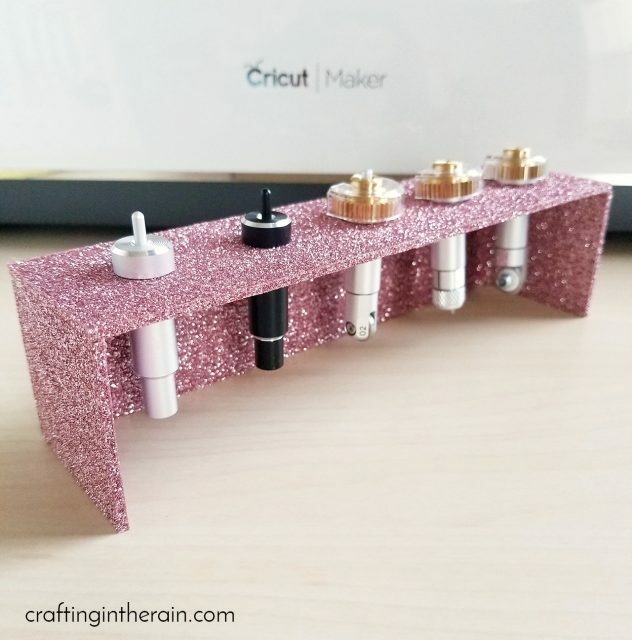 When I discovered the Cricut Maker Tool Holder project in Cricut Community by Nicole H, I knew I had to make one for myself. There are 6 holes, with 2 being larger for the rotary blade and scoring wheel. I decided to cut mine from chipboard and cover with glitter iron-on vinyl. Open the package of chipboard and let it sit for at least 24 hours to acclimate to your house. Use the Knife Blade (I usually find the best price there on Amazon) – remember the Knife Blade can only be used with the Maker, and using a laptop – no phone or tablet. Move the star wheels (the little white wheels on the metal bar in your machine) all the way over to the right. 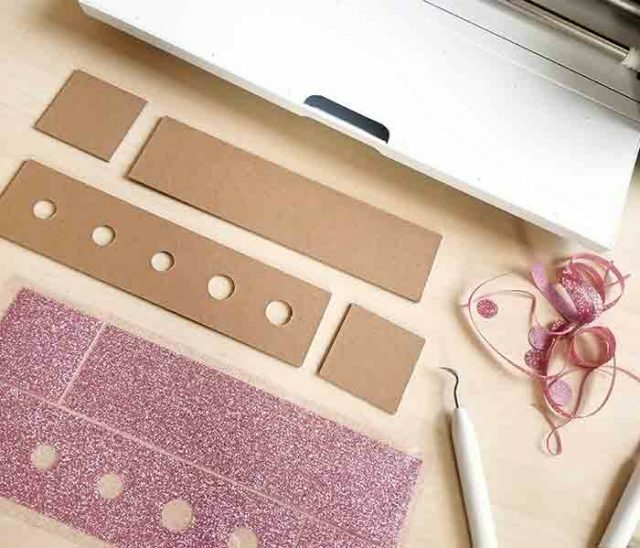 Tape the chipboard down to a purple mat, and make sure that you position it with the 11-inch side going across, and the 12-inch side going down, so that the star wheels won’t run over it at all. This could jam the machine. You will need to check your cuts before the machine finishes all passes. Most chipboard projects are getting set at about 20 passes, but most people find their cuts have completed by about 10-14 passes. Mine finished at 8! So don’t set your machine to cut with the knife blade and then walk away. 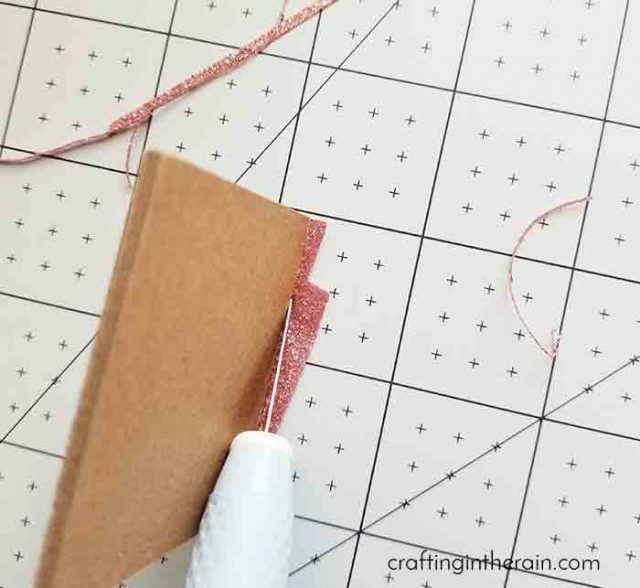 **How to check: pause the cut and lift up part of the chipboard, or use a weeding tool to try to remove an inside cut to see if it releases cleanly. If it does, you can eject the mat. If not, let it do another pass or two and check again. Sometimes a corner or small piece may be not quite cut through. 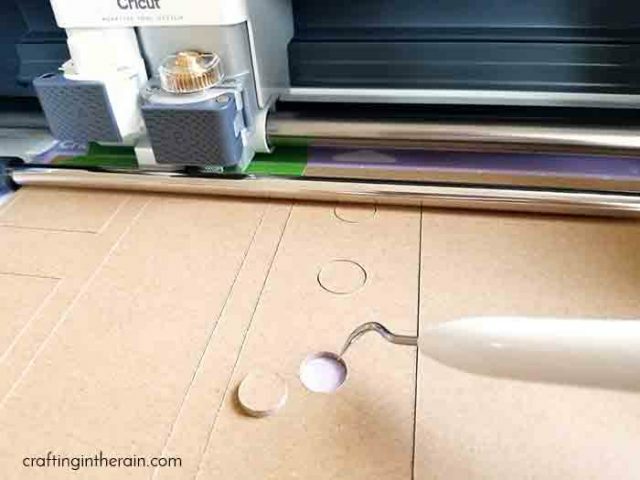 Use the TruControl Knife to carefully trim and release the last part of the design. 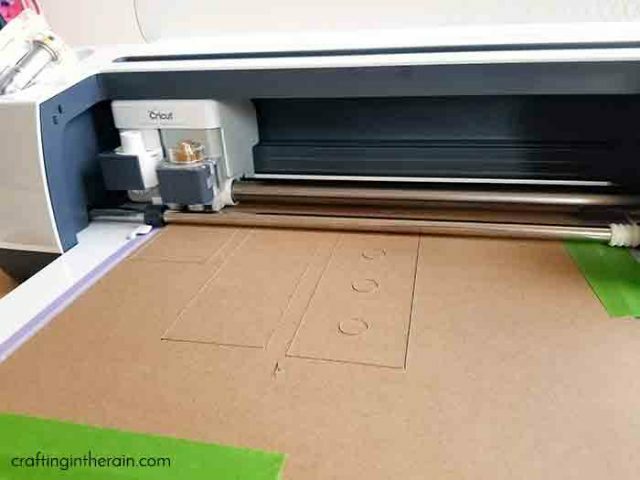 So there are my recommendations for cutting chipboard with the Cricut Maker. This project can also be made with basswood. Then you could paint it or stain it, and it would look really cool. I wanted to cover mine with pink glitter iron-on, so I cut the project out again using glitter vinyl. 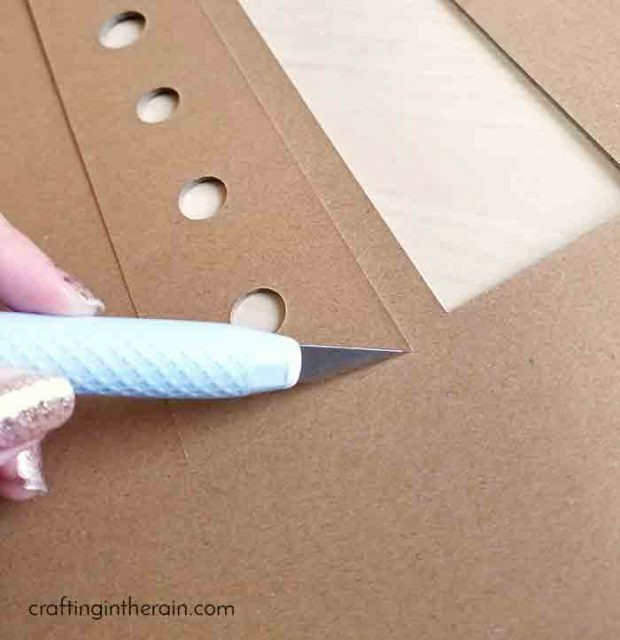 I also used my tiny craft iron to apply thin strips to the edges of the chipboard that would be showing. 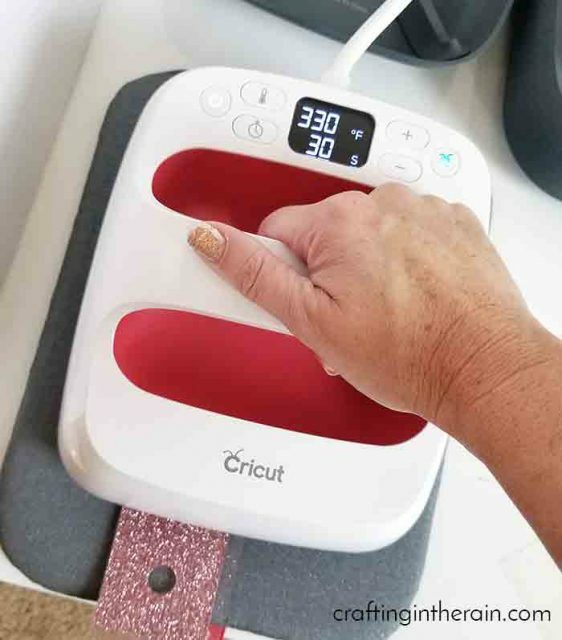 I used my TruControl Knife and the EasyPress 2 (which I loved using – safety guard so I couldn’t slip and cut my fingers, non-slip base, and stainless steel straightedge) to trim the excess iron-on away from the pieces. Go slowly so you don’t gouge out any part of the chipboard. 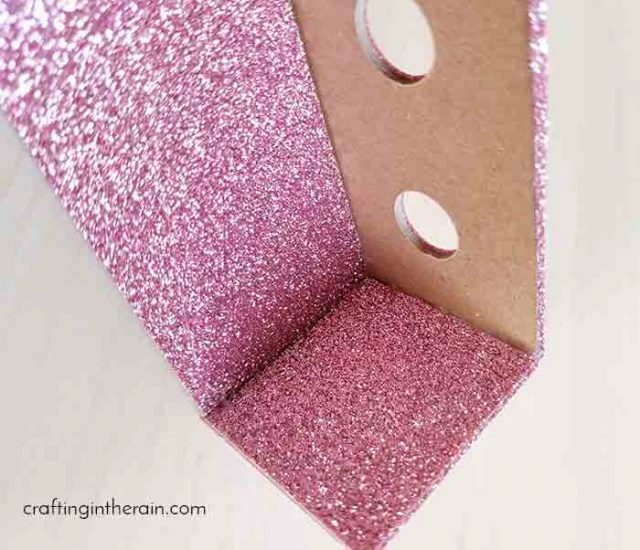 When all the pieces were glitter-fied, I use hot glue to assemble the holder. This holder fits all the blades and tools that I currently own. I love that it keeps the tools secure and safe from chipping or dulling the blades. 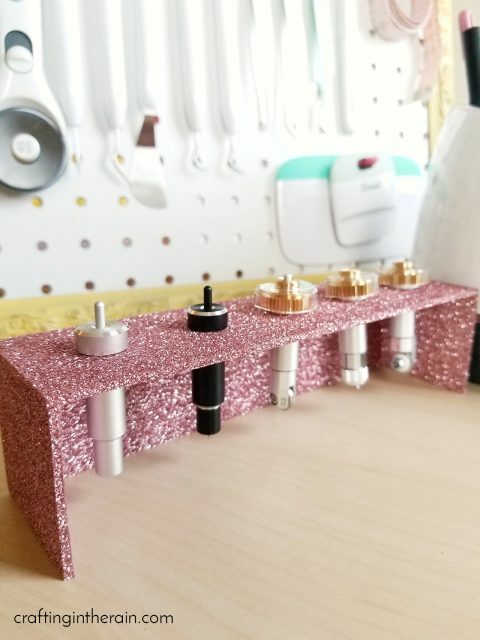 Check out this post if you want to see more of the pegboard Cricut tool organizer that’s in the background of this picture. It’s another great way I keep my tools organized and visible. Hey! The link to the tool holder doesn’t work anymore. Any chance you have the dimensions or at least the height, hole sizes and distance between the holes? Thank you , I finally found it. 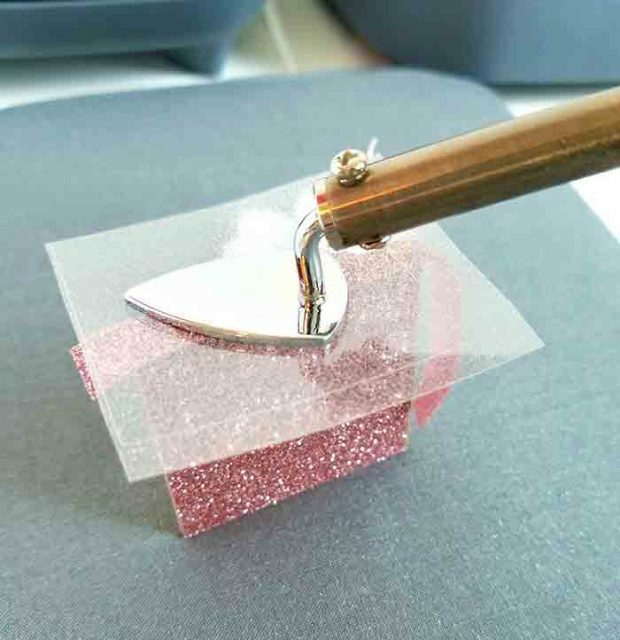 Just got the maker and wanted to make this for my blades, when covering it do you make the vinyl a little larger? Also can you use basswood?